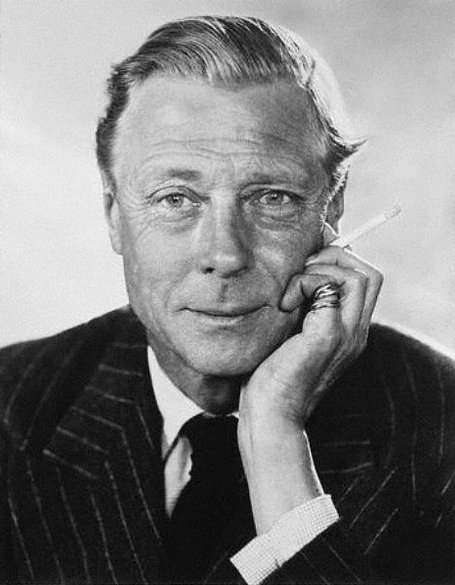 The Duke of Windsor with a ciggie and two Cartier Trinity rings. To get away from the election and post-election coverage I decided to start watching the new series The Crown on Netflix. I am enjoying it immensely. It has such high production values and great acting. What a visual treat too—the sets, the scenery, the costumes, the jewelry, and the makeup, my God, the makeup! 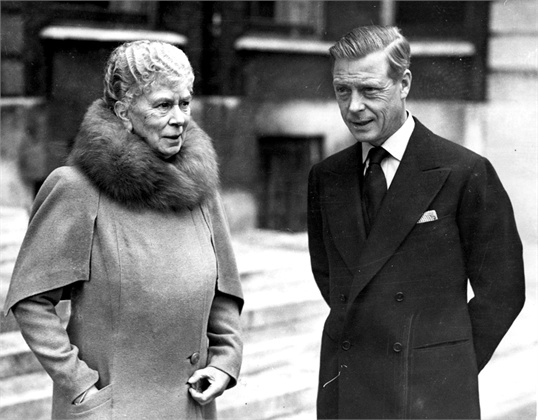 I have seen three episodes, including “Windsor,” which had all sorts of inaccuracies regarding the Duke and Duchess of Windsor—for one, Wallis was not present when David gave his famous “Abdication” speech on December 11, 1936, nor was his mother, Queen Mary. David and Wallis were portrayed in this episode with the negative patina they nearly always receive on screen, which wasn’t much of a surprise, since the focus in this series is on Queen Elizabeth II and how she came to be the Queen of England, and her branch of the family despised them. However, it reminded me of some of the posts I’ve done on the Duke and Duchess, which I loved putting together, so I couldn’t help returning to this subject. Before we get to that I have to share this shot from the show. Of course, if the spiffy dress didn’t give it away, the pugs would. 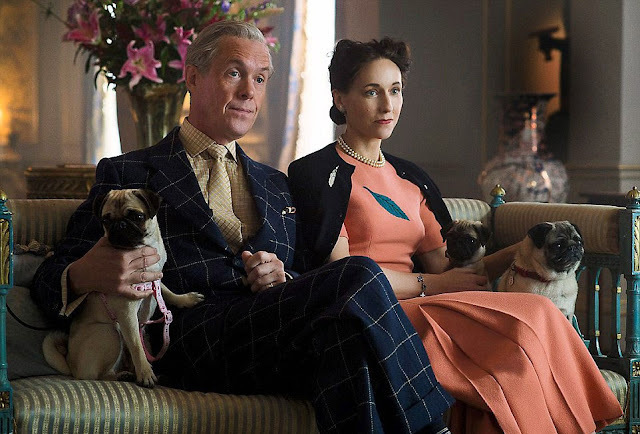 Here is how the Duke and Duchess of Windsor are portrayed in The Crown. This is an urelated side note but I love that baby pug so much, the one nestled in Lia’s arm. That face! Those eyes! I have not seen what happens in this episode so if you know, don’t tell me! Alex Jennings as the Duke of Windsor and Lia Williams as the Duchess. Photo by Netflix. 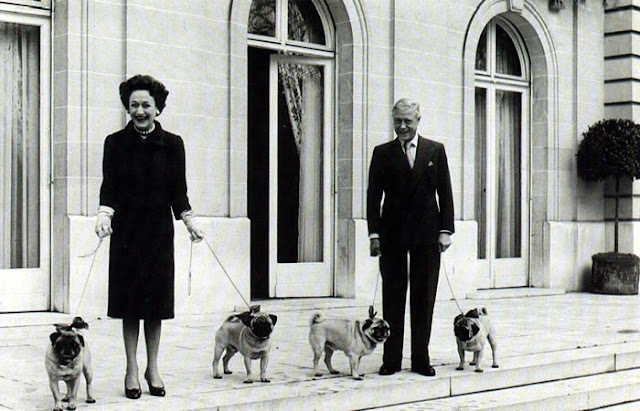 The Duke and Duchess with their pugs Trooper, Disraeli, Imp, and Davy Crockett. That last part seems particularly timely given the state of world politics. And how interesting to learn that the Duke thought life should be a challenge! The Duke with his mother Queen Mary in October 1945. Getty Images photo. I know plenty of people have a bad opinion of the Duke of Windsor but I have been cheered by re-reading these words about how somebody decided to Stay Positive even when (especially when! ), the going got tough. Let me know if you are watching The Crown and what you think of it. As a fellow pug Mom I cannot wait to see this episode. I have been watching The Crown but have found it slow going. Some of the tedious rules and regulations of upper English society bring back too many memories, not all of them fond of my time living and working there. Luv "The Crown". The production is Netflix's most expensive & looks it. The acting is just great. Particularly Claire Foy as the Queen, Alex Jennings as the Duke of Windsor & John Lithgow as Churchill. The story of Princess Margaret was so sad, because she couldn't marry the man she truly loved. She always seemed unhappy even when she did marry someone else. Apparently her marriage was a disaster. There were always so many truths, half-truths, lies & rumours about the Duke & Duchess. Particularly the one about their sympathy for the Nazis. Perhaps, his abdication was a blessing in disguise for England. King George & his young family were what England needed during WWII. A steady hand. Its amazing the the Duke & Duchess still fascinate after all these many years.